I haven’t played “The Fall Of Winterhome”—the recently released free expansion for ice-cold PC survival simulator Frostpunk—just yet, but I’m already sick to death of hearing about the destruction of the titular city. “Fall Of Winterhome” is a prequel campaign, you see, and by the time the game’s main story, “A New Home,” has begun, the city in question has already been destroyed. It’s news of the fall (and the realization that, in a world that’s slowly but surely freezing to death, your desolate icy shithole of a settlement might be the only remaining alcove of human life) that kicks off the first disastrous downturn in Frostpunk’s narrative, forcing the player to adapt quickly to keep some semblance of hope alive. It’s also the first moment that the game’s deeper agenda reveals itself, as the public panic caused by Winterhome’s fall forces you (as the city’s captain/dictator/potential god) to make a radical alteration to its society, pushing it toward either religious obsession or fascistic control. (Suggesting that we all just put our goddamn heads down and keep harvesting coal isn’t a good enough ethos to live by, apparently.) The worse things get, the further you’ll have to tread down either dark path, passing increasingly draconian laws (child labor, cannibalism, mandatory church attendance) to keep discontent or loss of hope from overwhelming the society, and working people close to death to keep the ever-hungry furnace—the only source of warmth in the Arctic wilderness—happy and fed. I’ve already had to edit about five repeat instances of the word “desperately” out of this write-up, and that’s a testament to how good Frostpunk is at making you feel like you’re living right on the precipice of an icy and unpleasant death. Resources dwindle quickly, death and disease are rampant, and the temperature gauge at the top of the screen is always trending downward. (In a brilliant touch, you can see weather changes coming a day or two before they happen, and it’s useful both as a tactical tool, and as a reason to go, “Oh, Christ, no,” when you see another brutal dip on the way.) It’s to the game’s credit that it frequently made me think of The Banner Saga, the only title I can think of where grueling, consequence-heavy combat is a lighthearted respite from the “Oregon Trail but with an entire traveling refugee camp” portions that make up the rest of the game. 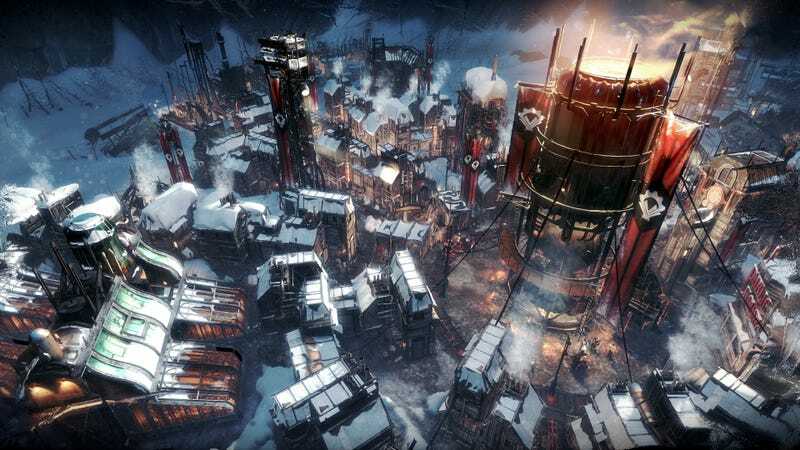 In its approach to politics, though, Frostpunk isn’t quite so successful, invoking instead a different, less flattering point of comparison: Fable III, which also presented these sorts of “survival vs. ethics” questions, and then made the misstep of linking the actual outcome to the player’s ability to game the system. (In Fable III’s case, it was all about owning property, creating a reality in which the most ethical system of government is a sort of pro-environmental feudalism where the king constantly jacks up rents to pay the bills.) Frostpunk isn’t quite so easy to break, but it still presents a world where ethical violations exist not in the interest of expanding power or ideology, but as stopgaps brought on by the player’s incompetence and the rising demands of scarcity. If you manage to keep everyone warm enough not to need to dub yourself the living voice of god, you’re automatically a good person in the game’s terms; otherwise, enjoy your cult. The moral framework presents itself as a pretty clear “what you are in the dark” test, but the game skews the results by testing something else: not your soul, but your resource management skills.